If you want to start recording on your computer, a one-stop package that gives you everything required to do it makes a certain amount of sense, and that’s what Steinberg is offering with its UR22mkII Production Pack. This contains not only the UR22mkII audio interface, but also the ST-H01 studio headphones, the ST-M01 studio condenser microphone (plus a microphone cable) and the Cubase Artist 9.5 DAW. You also get WaveLab Elements 9.5 for audio editing and mastering, and Cubasis LE 2 for the iPad so you can go mobile with your music making. Aside from a MIDI keyboard, that’s pretty much everything you need to get going. OK, a set of monitors will eventually be on your shopping list, but the headphones should suffice in the short term. 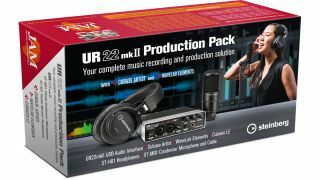 The UR22mkII Production Pack costs €399. Find out more on the Steinberg website.